Following Jada Pinkett Smith’s criticism of this year’s Oscars for the Academy’s failure to recognize films made by and featuring people of color, Spike Lee announced on Martin Luther King Day that he would not be attending the award show. Writing on Instagram, Lee launched off with the hashtag #OscarsSoWhite, which was started last year after no people of color were nominated for acting awards. He then thanked the Academy and President Cheryl Boone Isaacs—who expressed “disappointment” in this year’s nominations last week—for giving him with an Honorary Oscar in November (he also made similar comments then) but said that he and his wife would not be attending the awards in February. But, How Is It Possible For The 2nd Consecutive Year All 20 Contenders Under The Actor Category Are White? And Let’s Not Even Get Into The Other Branches. 40 White Actors In 2 Years And No Flava At All. We Can’t Act?! WTF!! It’s No Coincidence I’m Writing This As We Celebrate The 30th Anniversary Of Dr. Martin Luther King Jr’s Birthday. Dr. King Said “There Comes A Time When One Must Take A Position That Is Neither Safe, Nor Politic, Nor Popular But He Must Take It Because Conscience Tells Him It’s Right”. “For Too Many Years When The Oscars Nominations Are Revealed, My Office Phone Rings Off The Hook With The Media Asking Me My Opinion About The Lack Of African-Americans And This Year Was No Different,” he continued, going on to say that the “gate keepers” of Hollywood—i.e. studio executives—are preventing change from happening. “For Once, (Maybe) I Would Like The Media To Ask All The White Nominees And Studio Heads How They Feel About Another All White Ballot,” he added. “Begging for acknowledgement or even asking for it diminishes dignity, diminishes power. And we are a dignified people and we are powerful, and let’s not forget it,” she added. 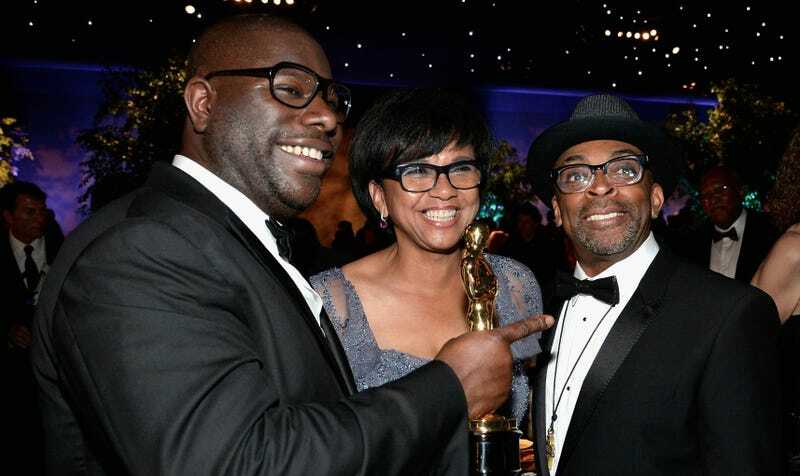 Lee after the 2014 Academy Awards with Steve McQueen and Academy President Cheryl Boone Isaacs. Image via Getty.